Among of five provinces in North-Central Vietnam, Thanh Hoa Province is surrounded by Son La, Hoa Binh, Ninh Binh provinces on the north, Nghe An Province on the south, East Sea on the east with 102km coastline, and Laos on the west. Cam Luong Fish Spring is another interesting place in Thanh Hoa, The stream contains thousands of fish that no one dares catch it. Fish in the stream have red mouth and fins, and brown scales, resembling carp. Please come to this place to play with fish, visit beautiful caves and grottos, watch dancing performances of Muong people and enjoy traditional lam rice and can wine. 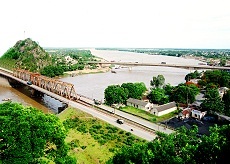 In addition of these, Thanh Hoa is famous of historical vestiges like Ham Rong Bridge, Ho Citadel and Lam Kinh Remains. Lam Son is the birthplace of national hero Le Loi and the starting point of the Lam Son revolutionary insurrection.